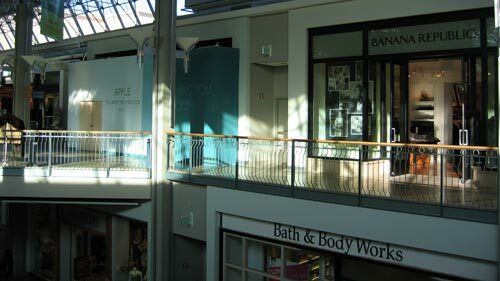 After several months of mysterious construction, and even a rumor it had been canceled, the Apple Store in Columbia, Maryland opened at the Columbia Mall on September 23, 2006. 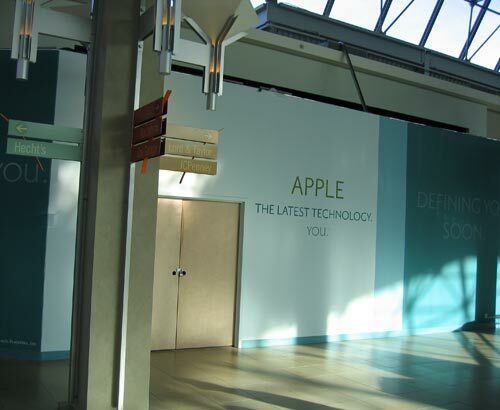 This store is the fifth in Maryland, and the tenth in the Maryland-DC-Virginia region, which also hosts the very first Apple retail store at Tysons Corner, Virginia. Early morning visitors to Columbia Mall were somewhat taken aback by the long line that formed prior to the opening. Extending from the front of the store, down a hall to exit the building, then across a skybridge to a parking garage, then down the ramp of the garage, the long queue drew an entertaining assortment of suspicious, puzzled, and curious looks. Mall security personnel, plus extra people wearing “Security” shirts, were on hand to keep the very orderly crowd in order. The first thousand people through the store received a black Apple T-shirt with Columbia printed on them, plus a chance to enter a Grand Opening Sweepstakes for, among other things, a black 13-inch MacBook and a silver iPod nano. The store was out of T-shirts well before noon. In addition to the usual PowerBook, iBook and MacBook owners in line, using the store’s open Wi-Fi connection to do various tasks, an even larger number were biding their time listening to iPods, or using digital cameras to take photos of one another. A few people were carrying Macs, obviously intent on visiting the Genius Bar. One woman, roughly a thousand feet from the front, anxiously wondered if she would get priority service because she was an AppleCare Pro customer. We wished her luck. Once in the store, the new layout surprised veterans of other Apple stores, and those who had never been in an Apple Store were delighted at all the things to play with. The new design has roughly twice as many computers, iPods, and other gadgets on display as similarly sized Apple stores and, as many remarked, “They’re turned on! And working!” The Genius Bar, the iPod Bar, and The Studio were soon swamped; by 10:29, a video screen announced “Sorry, no more Geniuses are available today.” How sad to think that you can exhaust the supply of geniuses in less than half an hour. It wasn’t clear if the very large staff will work there permanently or if they bulked up for the opening. Prior to opening the doors, the black-clad staff paraded out in a long line, clapping hands, shouting greetings, and leading cheers. Because of the throng, a count was impossible, but there were more than 50 though probably fewer than 100 staff members on hand. The sales area, located in the back of the store, soon had a long but quickly moving line of customers, and a steady stream of people left with the signature white plastic Apple shopping bags. By noon, the Mall resembled a MacWorld Expo, with Mac fanatics, Mac laptops, iPods, black Apple T-shirts and white Apple shopping bags everywhere. Naturally, not everyone knew there was a new store in the mall, but they soon found out. One mother, quizzing her daughter during lunch at the Mall food court, wanted to know why she wanted to go to the Apple Store instead of a clothing store. “Macs don’t have viruses, Mother.” “No viruses?” “None.” The mother looked skeptical, but agreed to “go look” at the Apple Store. The daughter positively beamed. “But you still need blouses,” added the mother. Columbia, Maryland, the second largest city in the state (even if it is unincorporated), finally joined Annapolis, Towson and Bethesda with its own Apple Store on September 23, opening at 10 a.m. These photos, taken at Columbia Mall months prior to the opening, tell you nothing at all.